The slowdown in China's economy is well reported. For some they see this as a natural right of passage for China as it's new found wealth mean double digit rates of annual growth become much harder to maintain. However, the impact of the global slowdown was seen at the end of last year as the China and US trade war stepped up it's impact. The fall in the S&P500 irked Trump so much , that he has started to send out promising noises about a US and China trade deal that is currently being discussed this week. He doesn't want the S&P500 to fall as he measures his success as a president by it's value. 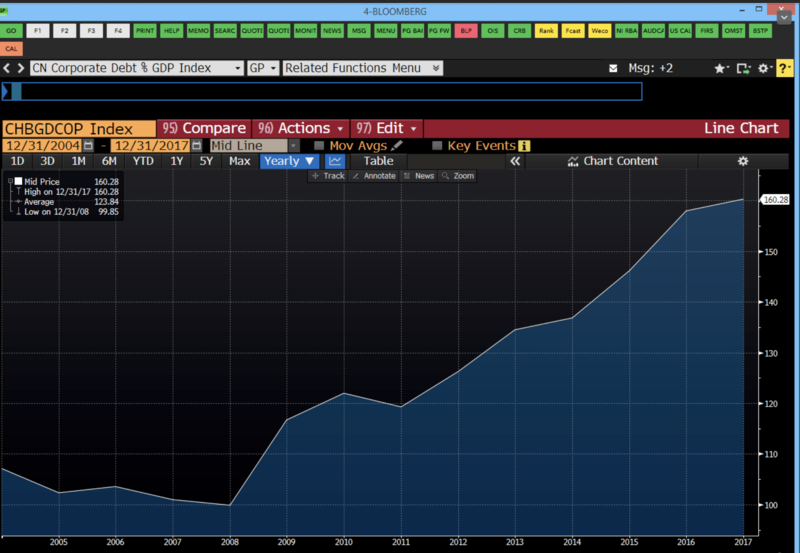 I read via Bloomberg that China's corporate bond market are heading for another record in defaults for 2019 after posting the all time high of 119.6 bln yuan ($17bln) in defaulted payments last year. This trend in growing defaults could raise further questions over China's economy especially as the corporate debt to GDP ratio is around 160% vs around 100% a decade ago. You can see this increase in the chart below. I suppose one of the changes in the Chinese economy is going from a save now, buy later mindset to the Western credit model of buy now, pay later mindset. You wonder how that strain will affect a slowing economy as the debt chickens come home to roost. The Bloomberg article makes the point that some may argue that this is a good thing for China as if they want to expand their corporate bond market then investors need to become more savvy at assessing the risk of Chinese firms. I suppose that is a positive spin to put on it, and is undoubedtly true in some sense. However, for now, it lays one more level of concern surrounding China's economy which accounts for approximately 15% of Global GDP. If the tariff , 01 March, deadline is not extended or cancelled then these kind of debt issues are going to be increasingly in focus.